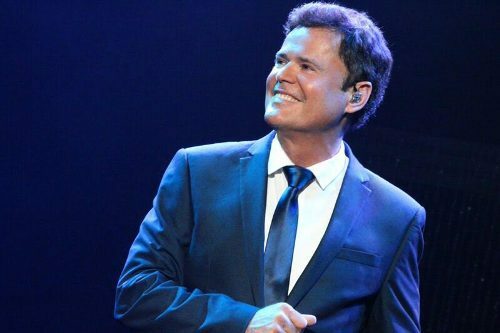 Former teen idol Donny Osmond is celebrating more than 50 years in showbiz with a UK tour that plays Birmingham's Genting Arena on February 3, 2017. The 59-year-old has sold over 100 million records, received 33 gold records, had three UK number ones, nine UK top 10s, 13 UK top 40s and spent 333 weeks in the UK charts. Donny-mania was at its peak in the early 1970s when he had hits with the likes of Puppy Love, Too Young and Go Away Little Girl. In 2014 he released his 60th album, The Soundtrack Of My Life, which features songs that are a summary of his life so far. Each track tells a story, tracing the memorable moments of both his professional and personal life – from being a child star to achieving multiple number ones and becoming a worldwide heartthrob. The UK tour gigs will feature a band, dancers and multi-media screens. There is also sure to be a touch of Vegas glamour as Donny has taken time out from his Las Vegas residency at The Flamingo to visit Britain. The show with sister Marie in the US gambling city has won them the Best In Vegas award by the Las Vegas Review Journal five years in a row. The residency began in September 2008 and was originally scheduled to run for six weeks. The response from concertgoers was so overwhelming that the Flamingo immediately asked for an extension. In 2013 the duo was honoured by having the Flamingo's theatre renamed The Donny & Marie Showroom. During his five decades of entertainment, Donny has been a singer, actor, television host (talk show, game show, variety show), best-selling author (his autobiography entered the UK bestseller chart at number one), and motivational speaker. In 2007 Donny starred on Broadway as Gaston in Disney's Beauty and the Beast, hosted two series on British television, was a special correspondent for Entertainment Tonight and performed at the Concert for Diana, seen worldwide by more than two billion viewers. The year 2008 marked the 50th year celebration of the Osmond Family in entertainment. The entire family made a historic appearance on Oprah, which set a daytime ratings record and made Oprah's list of Top Ten Best Celebrity Moments. The family then toured The UK, Australia and Asia for the first time in 27 years. In 2009, Donny was crowned Dancing with the Stars champion. One of Donny's most notable appearances was his starring role as Joseph in Sir Andrew Lloyd Webber's Joseph and the Amazing Technicolor Dreamcoat, which broke records during its six-year run, with more than 2,000 performances in the US and Canada. In 2013 there was the launch of Donny Osmond Home, a home furnishings line that marks the first time Donny has collaborated professionally with Debbie, his wife of 37 years. The couple have five children and eight grandchildren. Feb 3: Genting Arena, Birmingham. Why? Celebration of Donny Osmond's 50 year career. Where: Birmingham Genting Arena, and touring. Oh goodness! Donny Osmond - now there's a name that takes me back! I just loved listening to his songs!